We have just got married! After 10 years of adventures around the world, we finally decided to tie the knot. In true Travel Blogger fashion, we have decided to have 3 weddings. One in London, one in Italy and one in Malta. However, we haven’t decided on where to have our honeymoon yet. Any suggestions? Talking of honeymoons, over the years we have stayed in some amazing hotels where we thought to ourselves this place would make an amazing honeymoon hotel. 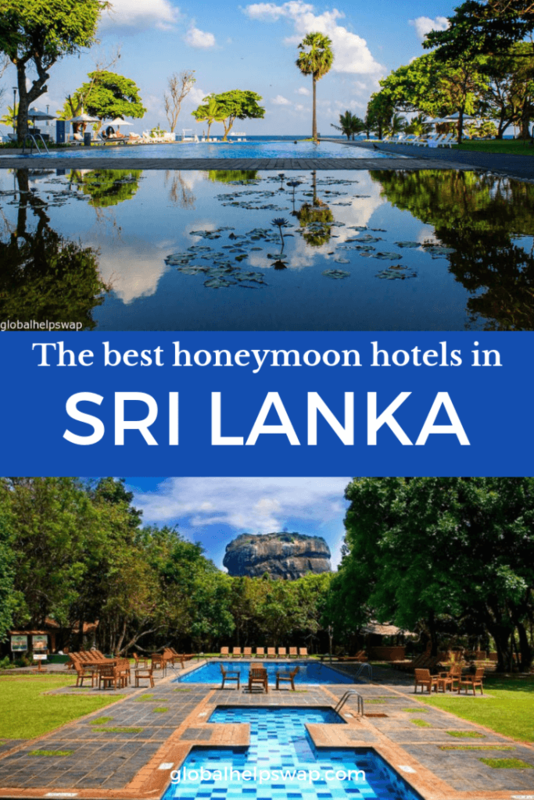 Most of them are in Sri Lanka so we decided to write a post on the best honeymoon hotels in Sri Lanka. Enjoy married life! Sri Lanka has some stunning hotels for honeymoons. 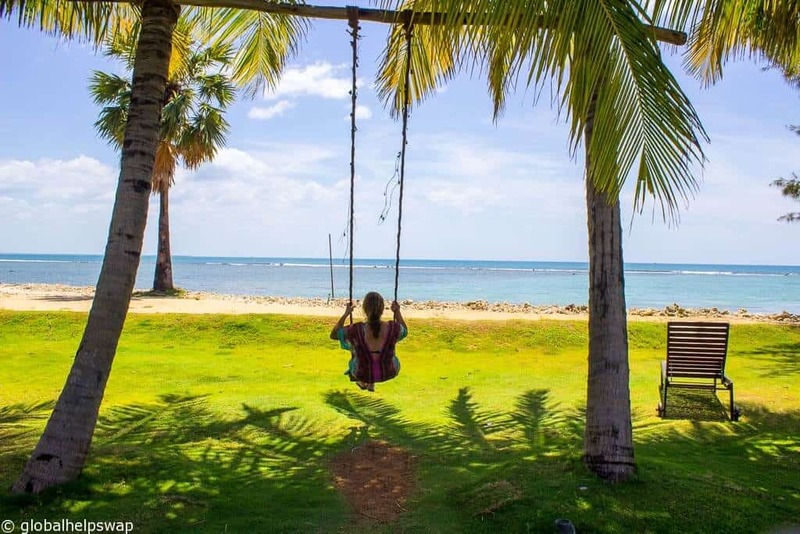 From 5 star hotels to super luxury safari tents, hopefully, this list of hotels will make your Sri Lanka honeymoon become a dream come true. Please save me for later. Just look at that bathroom! Can you imagine sitting there with a good book and a glass of champagne? Wild Coast Tented Lodge is adjacent to the famous Yala National Park, renowned for its dense leopard population. This luxury tented camp is situated where the jungle meets a pristine beach, overlooking the blue waters of the Indian Ocean. Previous guests loved the location, the food, the spa and the wildlife tours. Click here for the latest prices. Kahanda Kanda is a boutique-style hotel located 10.6 miles from Galle Fort. It offers an infinity pool, free parking and WiFi. As well as hosting many honeymooning couples, the hotel also arranges weddings at the hotel. Spacious rooms feature thatched roofs, wooden flooring and luxurious 4-poster beds with canopy. They have seating areas with comfortable sofas and colourful fabrics. A safe and minibar are available. Guests can’t stop raving about this hotel stating it is one of the best they have stayed in. Click here for the latest prices. If you are looking for some chill-out time after your wedding then Kumu Beach is the perfect hotel for you. This boutique hotel just has 10 beautiful rooms all facing the Indian Ocean. Previous guests loved the location, the food (especially the breakfasts) and the helpful staff. One guest declared that it was the best hotel he has ever stayed in. High praise indeed! Click here for the latest prices. Jetwing Vil Uyana is a hotel that is good for the heart and the soul. We should know, we stayed there a few years ago and was blown away by the place. This eco-hotel has beautiful lodge type bungalows scattered around the lush grounds. The level of service is exceptional and the food delicious. We had a massage overlooking the lake and we even helped with rice harvest during our stay! We highly recommend a visit. Check here for the latest prices. I wish we knew about Chena Huts when we were in Sri Lanka, the place looks amazing. You know a place is beautiful when you struggle to choose an image to feature it because there are so many amazing photos of Chena Huts. Located in the deep south of Sri Lanka, Chena Huts is just 5 minutes away from Yala National Park. Featuring free WiFi, a spa centre and an outdoor pool, Chena Huts offers fine views of the wilderness and seascape. It is designed to echo the local architecture harmonizing with the jungle environment. The reviews for this hotel are of the board with almost everyone giving it 10 out of 10. Check here for the latest prices. Imagine staying in a luxury hotel right in the heart of the jungle. Well, now you can at the Ulagalla Resort. Sitting on 58 acres of tropical vegetation, Ulagalla Resort offers villas with plunge pools and free Wi-Fi. It has a spa, freshwater pool and activities like horseback riding and archery. Surrounded by acres of paddy fields and orchards, Resort Ulagalla offers villas with great views. They feature a film library, a private patio which sun loungers and rain shower facilities in the bathroom. This is a hotel to get away from it all. Check here for the latest prices. This is another amazing hotel that we have stayed in. Cinnamon Lodge is an eco-hotel that goes above and beyond with its sustainable commitments. In the hotel grounds, there is an organic farm, a gift shop making gifts from Elephant dung (trust me, it is true) and the usual amenities that you would expect from a 5 * hotel. Our room at the hotel was probably bigger than our flat back in London. We also had our best meal in Sri Lanka at this hotel so there is enough to keep everyone happy. Check here for the latest prices. The Sun Aqua Hotel is rated very highly by previous guests. Located in Kalkudah, Sun Aqua Pasikudah offers peaceful and comfortable accommodations with free WiFi access. Surrounded by lush greenery, it features an outdoor pool, fitness centre, 24-hour front desk and free parking on site. Offering sea views from the terrace/balcony, air-conditioned suites come with a wardrobe, sofa seating area, a personal safe, mini-bar and a flat-screen TV with satellite channels. The private bathroom has a bathtub or shower, hairdryer, bathrobes and free toiletries. The hotel has hosted many honeymooning couples, the rooms with the private pool are very popular. The staff will make sure your stay will be personal and memorable. Check here for the latest prices. The Uga Bay Hotel looks like it is designed to fill your Instagram feed! The shots online of this place are beautiful and make me want to jump on a plane to Sri Lanka right away. This property is 3 minutes walk from the beach. Set along the beachfront just yards away from the pristine beaches of Pasikudha Bay, Uga Bay features well-appointed rooms, a spacious outdoor swimming pool and free Wi-Fi access. People love the location and it is not hard to see why. The hotel has lots of space so you never feel like you in a crowded resort. The food gets rave reviews too. Check here for the latest prices. If you know of any other hotels in Sri Lanka that would be great for honeymooning couples, please let us know in the comment section below.